The Floyd’s Pick book award is given annually to a book written by an Ohio author or illustrated by an Ohio illustrator that is representative of high-quality literature created for children. It is given to carry on the legacy of Floyd Dickman’s work to support and share children’s literature. For the first time, the CTRO Advisory Council has also selected Floyd’s Pick Honor Books for 2019: First Star: A Bear and Mole Story by Will Hillenbrand and Bark Park by Trudy Krisher, illustrated by Brooke Boynton-Hughes. The Day You Begin (Nancy Paulsen Books, 2018) is a timely and valuable book for parents, librarians, teachers, caregivers, and especially for all children. Woodson’s text is gracious, generous, and encouraging; and López’s illustrations compelling and sensitive. Along with Angelina, Rigoberto, and the other characters, children reading this book (or having it read to them) will gain affirmation and reassurance that differences are to be celebrated, not feared. Jacqueline Woodson is the 2018-2019 National Ambassador for Young People’s Literature and the author of many books for teens, children, and adults, including Harbor Me and the National Book Award-winning memoir, Brown Girl Dreaming. Born in Columbus, Jacqueline Woodson lives with her family in Brooklyn, New York. Rafael López is an artist and picture book illustrator who lives in San Diego, California, and San Miguel de Allende, Mexico. 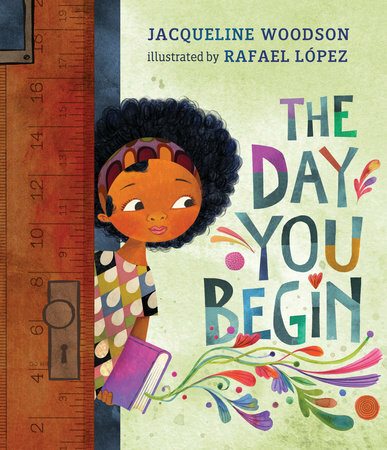 Visit the Penguin Random House website for more information on Jacqueline Woodson, Rafael López, and The Day You Begin. Will Hillenbrand, author and illustrator of Floyd’s Pick Honor Book First Star: A Bear and Mole Story and over 70 other books for children, grew up in Cincinnati and lives in the Cincinnati area. Trudy Krisher, author of Floyd’s Pick Honor Book Bark Park, was born in Macon, Georgia, grew up in south Florida, and lives in Dayton. Visit the Holiday House website to learn more about First Star. Visit the Simon & Schuster website to learn more about Bark Park. Floyd Dickman was a Library Consultant at the State Library and retired in 1999 after 23 years of service. He was a tireless advocate for children’s literature and librarianship who had a tremendous positive impact on library and literacy services in Ohio and across the country. Upon his retirement, the State Library of Ohio Board’s retirement resolution recognized Floyd’s leadership, commitment, and passion for library services, children’s literature and family literacy. Floyd is also remembered for his dedication to and enthusiasm for teaching and mentoring librarians and library science students. During his career he was awarded the Ohio Library Council Librarian of the Year award and was named Outstanding Friend by the Ohio Family Literacy Task Force. Floyd Dickman passed away in June 2015. The CTRO Advisory Council established Floyd’s Pick in December 2015 with a proclamation by Beverly Cain, State Librarian of Ohio. Ohio author and illustrator Loren Long, winner of the first Floyd’s Pick Book Award for Little Tree, has graciously agreed to provide the art for a Floyd’s Pick book seal to debut soon. For more on Floyd’s Pick, visit our website. Choose to Read Ohio (CTRO), a project of the State Library of Ohio and the Ohioana Library, spotlights Ohio authors and promotes reading across Ohio. Every two years, a booklist of 20 representative titles for all ages is selected, with the input of dozens of Ohio librarians, educators, and others invested in readers and reading. Explore the new 2019 & 2020 CTRO booklist, and download free readers’ toolkits for all 95 previous CTRO titles since the program’s inception in 2009: library.ohio.gov/ctro.